Fertilizer: There are lots of fertilizers out there, but I use one called Colorado’s Own Vegetable Food—it’s good for all kinds of veggies. It’s in a orange bag, and the numbers on the bottom are 5-10-5 (sorry I don’t have a photo yet). Go to Echter’s for this. (If you haven’t been to Mecca—I mean Echter’s—yet, go. Just go. I apologize now for the damage it will do to your check book. (I am sure that will be the subject of a future post.)) One bag of fertilizer should be enough, unless you have a huge plot you are planting. It should say on the bag how big of an area it will cover. Extra is not bad here—you will use more later in the season. Vermiculite: This is optional. Vermiculite works like little bitty sponges, so holds moisture really well, and probably means you can water a little less often. But it’s pricey. I only use it in starting seeds indoors (more on seed starting soon). If you happen to have sandy soil, it might be a worth investment, since sandy soil tends to dry out faster. Turning the beds: now it’s time to get down and dirty (literally)! Whatever your favorite work out music is, turn it on full blast. Green Day is my preferred score for this particular stage of the gardening process. Take equal parts Soil Pep and compost (and vermiculite if you choose to use it), and pour the appropriate amount over the garden area. Use the rake to spread them all somewhat evenly over the top of the garden. 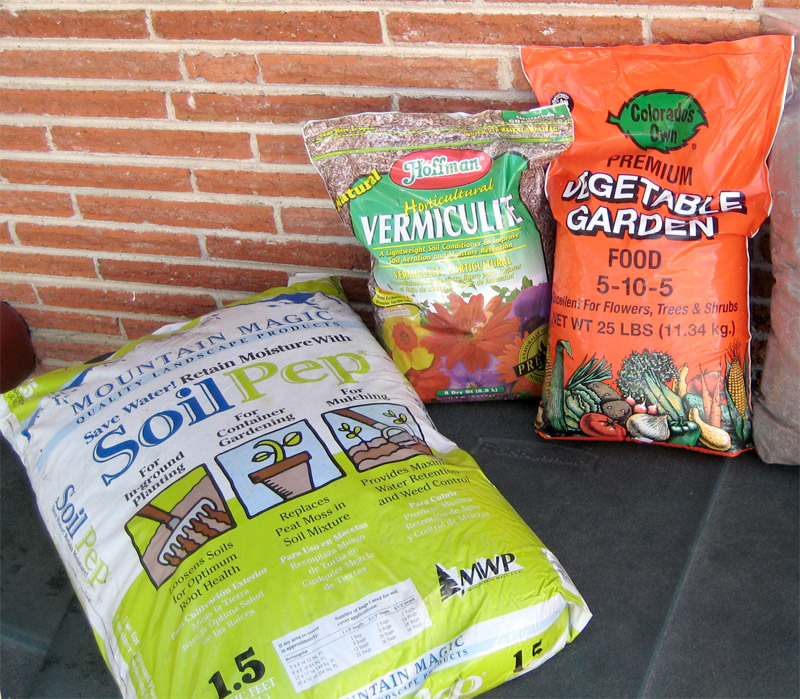 Then get your vegetable fertilizer, and spread that over top of the area according to the package directions. The idea is to get the compost, Soil Pep, and fertilizer evenly distributed and mixed in with your existing soil to a depth of about a foot. Then use your rake to even everything out so that you have a nice flat surface. Done! I do this every year before planting anything. Once you have done this a couple of years, your soil will be in much better shape, and you won’t have to break your back trying to turn it over. You can also use less compost and Soil Pep down the road if you want. The good news is the hard labor is over! Next step: decide what you want to plant (and eat)! Before: Weeds and dead plants need to be removed. Also, get the irrigation lines out of the way. Even the surface with the back of your rake. You are ready to plant! Great tips! This is the most important step for success but I hate every minute of it. I grew carrots last year and needed to go deeper. As it turns out, I didn’t think carrots were worth growing (my plot is small and there are other vegetables I would prefer to put in). Gypsum is also a good thing to add to clay soli.